As a junior varsity amateur photographer (who is sometimes on the bench), I love reading tips and tricks to up my photo skills. The "Rule of Thirds" is a photo, art, and design concept that has been around for centuries and is consistently referenced in "how to take better pictures" articles. This, coupled with the need to take quality, beautiful photos for social media content, means I want to know more. TL;DR: Check out this photographer's comprehensive but simple guide, or check out my favorite stock photography site that saves me tons of time. "Analogous to this "Rule of thirds", (if I may be allowed so to call it) I have presumed to think that, in connecting or in breaking the various lines of a picture, it would likewise be a good rule to do it, in general, by a similar scheme of proportion; for example, in a design of landscape, to determine the sky at about two-thirds ; or else at about one-third, so that the material objects might occupy the other two : Again, two thirds of one element, (as of water) to one third of another element (as of land); and then both together to make but one third of the picture, of which the two other thirds should go for the sky and aerial perspectives. This rule would likewise apply in breaking a length of wall, or any other too great continuation of line that it may be found necessary to break by crossing or hiding it with some other object : In short, in applying this invention, generally speaking, or to any other case, whether of light, shade, form, or color, I have found the ratio of about two thirds to one third, or of one to two, a much better and more harmonizing proportion, than the precise formal half, the too-far-extending four-fifths—and, in short, than any other proportion whatever." If you got through that, bravo. I am a visual learner, however, so I need to see it to understand it. Make it a habit to always show this grid on whichever camera you are using to help you refine this technique and remind you how to line up your shot. So, what's the deal with this "rule" and why does it work? In essence, if your subject is in the middle of the shot, it looks static. If your subject is closer to one of the edges, then your eye is forced to follow it, which means your eye lingers on the photo longer. It gives the illusion of movement and a story. In the above photo, the lifeguard tower is lined up with the left third, and the stairs lead the eye to the right third, which is lined up with the shore break. Speaking of horizontal lines (typically the horizon), always line it up across the top third or bottom third. 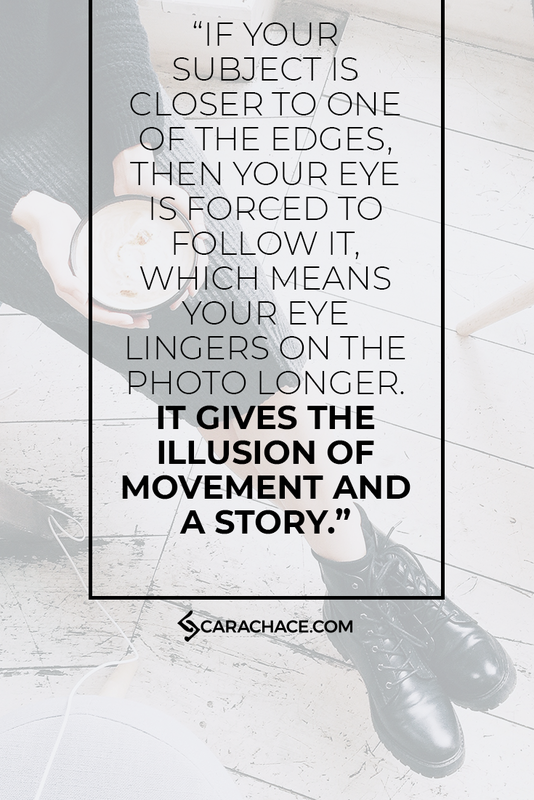 Again, this principle creates movement, interest, and context behind a snapshot of a moment. So when do you break the rules? Understanding of a rule is the best way to know how to break it. If you aim to create balance in a photo, then obviously the focal point should be centered. Portraits can also benefit from balance, especially when combined with depth of field. If you're going to take a portrait photo with the subject centered, make sure they are looking off into the distance and not directly at the camera. This helps create that feeling of a story as the viewer wonders what they are looking at. This rule also applies when you are creating your custom graphics and/or using stock photography. Rachel Clearly of Photography Talk is an expert in all this and has a super comprehensive and easy-to-understand guide on her site. She knows way more than I ever could about how to get the Rule of Thirds nailed. If you want to just find some amazing stock photography and use your time for other things, check out Girl Boss Stock* - I absolutely love them for all my marketing graphics.